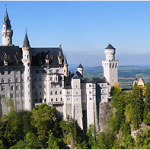 The inaugural Oktoberfest was first celebrated in Munich in 1810 in honor of Prince Ludwig’s marriage to Princess Therese von Sachsen-Hildburghausen. The festivities began October 12, 1810, and lasted nearly a week until October 17, ending with an exciting horse race. After such a spectacular party, the happy couple decided that the same type of festival should be continued annually. In the following years, the festivities were repeated every October and they eventually moved forward into September. Today, Oktoberfest is the largest festival in the world, with an international flavor that is extremely characteristic of the 21st century. More than 6 million visitors from all over the world take part in Oktoberfest every year. Moving the festival into late September has allowed for better weather conditions in the always changing Bavarian climate. 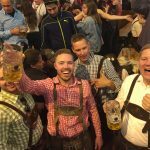 Because September nights in Bavaria are warmer than October nights, visitors are able to enjoy the outdoor beer gardens as well as the fairgrounds filled with carnival rides. Historically, the last weekend of Oktoberfest lands in the first week of October. Oktoberfest starts on a late September weekend and lasts for three weekends. This year’s dates are September 20-Oct. 5. 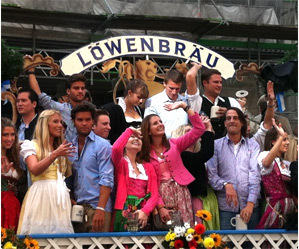 The first “Oktoberfest” took place in Munich, on October 12, 1810: For the commemoration of their marriage, Crown Prince Ludwig (later King Ludwig I) and Princess Therese of Saxe-Hildburghausen (namesake of the Theresienwiese festival grounds) organized a great horse race (the marriage took place on October 12; the horse race on October 17 — therefore, there are different dates named as being the first Oktoberfest). In 1813, the Oktoberfest was called off as Bavaria was involved in the Napoleonic war. In 1816, carnival booths appeared. The main prizes were silver, porcelain, and jewelry. In 1819, the town fathers of Munich took over festival management. They decided that the Oktoberfest should be celebrated every year without exception. Later, it was lengthened and the date pushed forward. The reason being that the end of September in Bavaria often has very good weather. 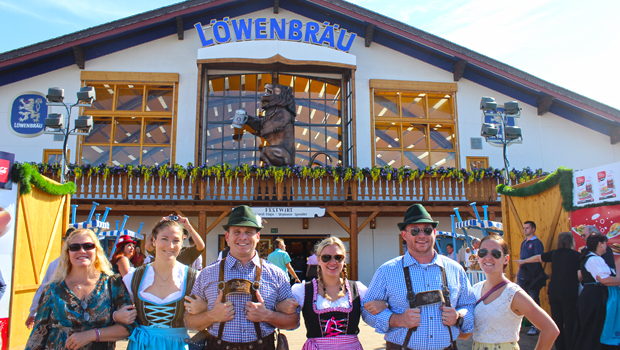 The high temperature in the first week of Oktoberfest nears 30 °C which stimulates the thirst of the visitors. However, today the last week of Oktoberfest is still in October. To honor the marriage of King Ludwig I and Therese of Bavaria, a parade took place for the first time in 1835. 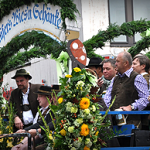 Since 1850, this has become a yearly event and an important component of the Oktoberfest. 8,000 people — mostly from Bavaria — in traditional costumes walk from Maximilian Street, through the center of Munich, to the Oktoberfest. The march is led by the Münchner Kindl. Since 1850, the statue of Bavaria has watched the Oktoberfest. This worldly Bavarian patron was first sketched by Leo von Klenze in a classic style and Ludwig Michael Schwanthaler romanticised and “Germanised” the draft; it was constructed by Johann Baptist Stiglmaier and Ferdinand von Miller. In the year 1910, Oktoberfest celebrated its 100th birthday. 120,000 litres of beer were poured. In 1913, the Bräurosl was founded, which was the largest Oktoberfest beer tent of all time, with room for about 12,000 guests (today, the biggest tent is the Hofbräu-Festhalle, which holds 10,000). Since 1950, there has been a traditional festival opening: A twelve gun salute and the tapping of the first keg of Oktoberfest beer at 12:00 by the current Mayor of Munich with the cry “O’zapft is!” (“It’s tapped!” in the Austro-Bavarian dialect) opens the Oktoberfest. The first mayor to tap the keg was Thomas Wimmer. By 1960, the Oktoberfest had turned into an enormous world-famous festival. After this foreigners began to picture Germans as wearing the Sennerhut, Lederhosen, and the girls in Dirndl. Horse races ended in 1960. There are many problems every year with young people, who overestimate their ability to handle large amounts of alcohol. Many pass out due to drunkenness. These especially drunk patrons are often called “Bierleichen” (German for “beercorpses”). They are brought by staff to a medical tent where drunks as well as sick people are treated. 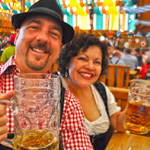 To keep the Oktoberfest, and especially the beer tents, friendly for older people and families, the concept of the “quiet Oktoberfest” was developed in 2005. Until 6:00 PM, the tents only play quiet music, for example traditional wind music. Only after that will Schlager and pop music be played, which has led to more violence in earlier years. The music played in the afternoon is limited to 85 decibels. With these measures, the organizers of the Oktoberfest hope to curb the over-the-top party mentality and preserve the traditional beer tent atmosphere.